Please refer to our stock # FG38 when inquiring. 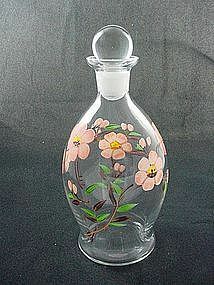 These hand painted decanter bottles were produced by Imperial Glass Company. The shape is shown in the 1941 catalog with various cuttings and decoration. The hand painted flowers are enameled - they do not wash or scrape off the way cold paint would - and are the perfect compliment to FireKing's Peach Blossom decoration. I have 2 different styles. One has a round stopper, the other is more of an apothecary jar shape and has a long stopper. The styles are approximately 7 1/2 - 8 1/2 inches high to the top of the stopper, and hold 24 - 28 oz. Please specify which you prefer - I have 4 of each style.